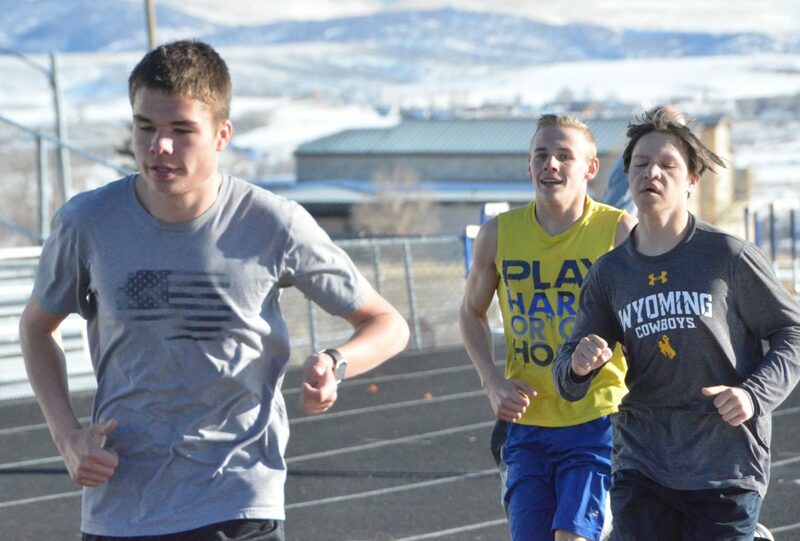 Moffat County High School long-distance runners Carter Severson, Coltyn Terry and Dave Drake warm up on the MCHS track. Moffat County boys won five events in the Palisade Classic. Moffat County High School athletes have leapt off the starting blocks in all regards as the track and field season begins anew. MCHS boys took five wins at the Palisade Classic Saturday in Grand Junction, with first-place honors in the 100-meter dash, 400 dash, 4×200 relay, long jump and shot put. Victor Silva had the best finish in the 100 sprint at 11.99 seconds, while Miki Klimper earned top honors in the 400 at 53.92. In the 4×200, Klimper ran the opening leg of the relay, with Grant Wade and Jared Atkin following and Silva the anchor, hitting a time of 1:35.73. In the field, Blake Juergens hit a mark of 19 feet, 10.5 inches in the long jump pit to win the day, while thrower Jesse Earle added more than 10 feet to his seed distance in the shot put, making it to 41′ 1″. 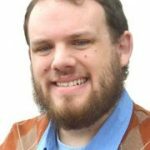 Earle was followed by Aaron Hernandez in second in the shot put (39′ 6.5″). Also taking the silver among boys teams was the 4×400 relay group of Klimper, Wade, Elias Peroulis and Isaac Trevenen at 3:46.30. Placing third in the 4×4 were Atkin, Carter Severson, Silva and Colin Jensen. Atkin also earned the bronze in the 110 hurdles at 17.84 seconds, while Earle’s performance in the discus got him fourth (120 feet) closely followed by Zane Shipman in fifth (115′ 8″). Other boys highlights included Toryn Hume fifth in the shot put (37′ 9″), Severson fifth in the 1,600 run (4:52.32), Klimper fourth in triple jump (36′ 10.25″) and Colin Jensen hitting a 5′ 10″ for fourth in the high jump. On the girls team, Kelsey McDiffett took the best placement of the day, second in both the 800 and 1,600 runs, 2:46.75 in the half-mile and 6:07.55 in the mile. Abby Bohne got third in the 400 dash (1:06.57), while Liberty Hippely wasn’t far behind McDiffett for fifth in the mile at 6:24.55. A smaller roster for the weekend left the girls with no relay teams, but they also picked up points in the high jump and triple jump as Eliana Mack got fourth and fifth, respectively, at 4′ 8″ and 28′ 6″, the former of which was Moffat County girls’ best vault in the high jump since 2013. 2017 state placer Morgan Nelson gained third and Caylah Million fourth at 93′ 1″ and 91′ in the discus, with Million taking fifth in the shot put at 28′ 4″. MCHS athletes will travel Friday to Rifle. Craig Press will have full results from the Palisade Classic.